Looking for Log Home Love? Let us do a little bit of internet match-making for you. How about this fantasy come true ... you and this beautiful log cabin on Lake Arrowhead! Tell me, have you ever heard of a "vinyl cabin"? 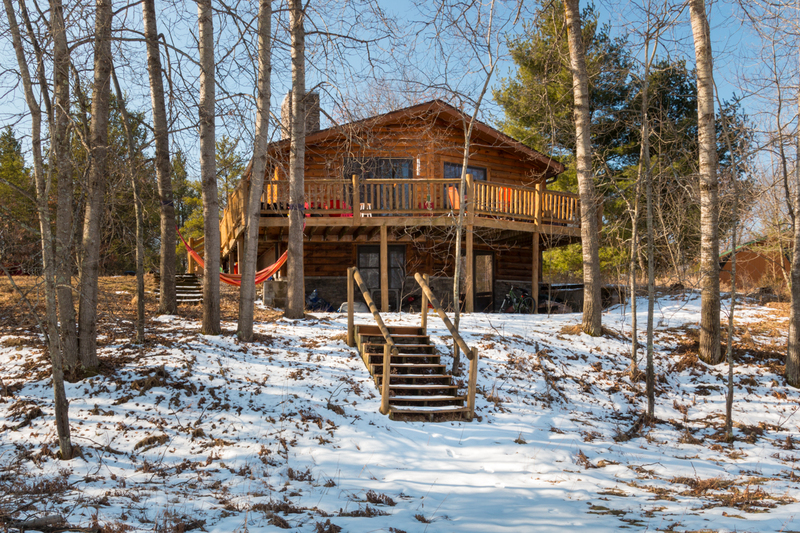 A cabin has logs, knotty pine, and stone ... top to bottom, inside and out! Features of this 2 bedroom, 2 bath log ranch with walk-out includes a large great room with a cathedral ceiling finished in warm pine carsiding and log beams, accented by a rustic woodstove and stone backdrop; hickory kitchen with solid surface tops, breakfast bar and adjacent lakeside dining space; two main level bedrooms and full bath; wood ceilings throughout main level; smartly finished lower level with family room (plenty of room for guest crashing), full bath with large whirlpool tub, lakeside walkout and patio; log and stone exterior; lakeside deck with "Trex-type" decking & log railing; aluminum pier & boat lift. This unique property borders a large lakeside green space area making it a perfect outdoor playground for the kiddies and dogs. Lake Arrowhead, a log cabin, and you ... a match made in heaven!